The drone industry is booming, thanks to exciting new technology, with plenty of excited consumers lined up to buy them. With all this attention, eventually they attracted the notice of a pro-police lobbyist, who knew they’d be perfect for law enforcement. Future weapons drones will be equipped with weapons, but have only been approved for non-lethal types. The Bill was originally drafted by House Representative Rick Becker. It’s original intent had nothing to do with drones carrying weapons. In fact, he didn’t want drones to carry weapons at all. 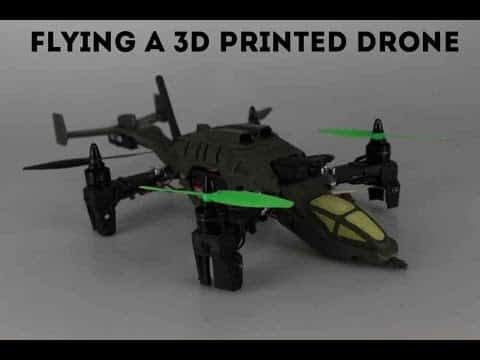 The bill was to be used to allow the police to obtain a search warrant from a judge, where they could then use a drone to search a property for criminal evidence. Bruce Burkett from the North Dakota Peace Officers Association was allowed to amend this bill. Instead of all weapons, only lethal weapons would be prohibited. Other types of weapons would still be allowed. Rick Becker said he wasn’t happy, but he’d have to live with it. He said no drone should be weaponized, period. He’s disappointed that the bill has exclusions. What types of weapons will be allowed on police drones in North Dakota? 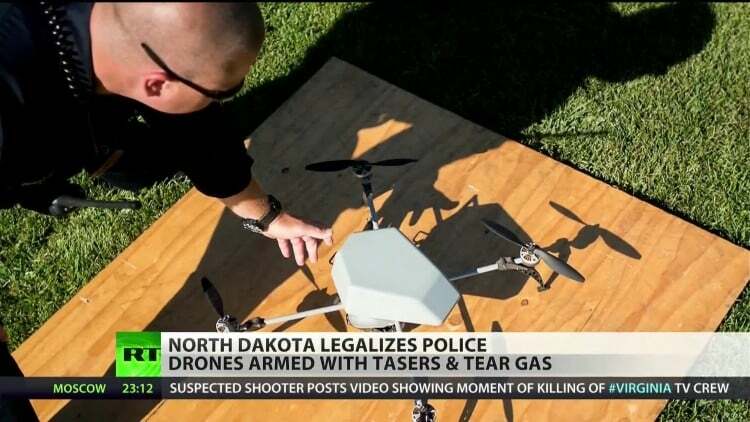 Police drones in North Dakota will now be allowed to carry tasers, rubber bullets, pepper spray, tear gas, and sound cannons. The year has not yet ended, but over 39 people have been killed by police tasers in 2015. Any weapon has the potential to maim and kill. There have been many instances of rubber bullets, bean bags, and flying tear gas canisters maiming and causing injuries. Becker is worried about police firing blindly on criminals. Not only is there that limited field of view, but a disconnect that happens when a cop is not directly on site. They have to make decisions in a situation that they cannot fully comprehend. There is also the risk to the public. People on the ground who have nothing to do with a criminal may potentially be injured by the use of these so-called non-lethal weapons. As long as there have been drones, they have been used by the military. Germany used drones against Britain in WWII. In the past, drones were too expensive to be used by police. But now the prices are decreasing. But in the case of the Grand Fork’s County Department, they have been loaned two drones. Sheriff Bob Rost doesn’t think that he should need a warrant if he wants to go snooping. After all, his aren’t equipped with weapons. He believes that Bill 1328 was a bad one to begin with. Rost feels that drones should be used for police surveillance, so that they can determine if a warrant is needed, for a more thorough search. He thinks people have nothing to fear, if they are hiding nothing. His sheriff’s department has obviously used drones in the past, but he’s not admitting anything. The department refused to give an accounting of flights going back to 2012. They only turned over records after an appeal by the state general’s office. His office recorded 21 missions, yet apparently the FAA claim that he flew 401 missions during that period. Initially the sheriff said drones were only used in situations for non-criminal activity. They may be used to hunt for a missing person, or to photograph an accident scene. But what actually happened was an incidence where a drone found a cattle thief. A homeland security drone was flying a mission, when a drone caught a cattle thief. Rodney Brossart’s neighbor had a few cattle wander onto Brossart’s land. He didn’t say anything. When his neighbor requested the return of the cattle, he refused. That’s when police asked Homeland Security’s Predator drone to help them out. The Predator is normally used to hung for drug smugglers, but caught the cattle thief instead. There were many others who disapproved of Bill 1328, including the founder of a drone company, and the director of the University of North Dakota’s drone majoring program. Since weaponized drones are a scary thought, why are so many opposed to a bill that will attempt to control them? Most likely because these bills could have a negative effect on drone manufacturers. Drones are mostly sold for entertainment purposes, and the average consumer is the one that a manufacturer will focus on. Losing a major source of revenue could shut down manufacturers, just when they’re starting to come out with exciting new features. These laws may limit drone development, according to Keith Lund. He’s the Grand Forks Regional Economic Development Corporation. Republican Rep. Gary Paur is curious as to why a warrant for police surveillance could potentially restrict development of drones by manufacturers. Keith Lund says that investors may seek opportunities elsewhere, when they see that drones are being controlled under the scope of a legal Bill. In the past North Dakota had made big money in oil. But as resources were used up, it was hit hard by the oil bust. It found new industry with drones. The university offers a four year program in drones. Even the air force has partnered with the private sector to do drone research. They have set up a development park. And Northropp Grumman has been advertising their drones at hockey games. In the past when agencies wished to run a drone for law enforcement, it would have to notify the FAA when they were deployed. This is why many believe that the Bill was completely unnecessary, when the FAA was governing drone laws in the first place. And until drone laws prohibit the flying of a drone on private property, by law or individual, the Sheriff’s office will continue to fly their missions. But the discrepancy in numbers of missions flown shows that perhaps police drone flights need to be better governed, especially after they start allowing them to be weaponized.